As many people within our own community know, Tawasentha Park, a Guilderland landmark and wonderful recreation facility for the entire family, was struck by misfortune this past weekend when a fire destroyed the park’s pool house. The park’s annual “opening” event, Mud Mania, had to be postponed and the park was closed Monday and Tuesday due to the lack of electricity. As of today, power has been restored, and the park (minus the pool) is back in operation! Furthermore, there are plans to have pool access restored by the Fourth of July holiday (Times Union). Tawasentha Park holds a very dear place in our hearts at CrossFit Aevitas. The Guilderland Performing Arts Center (GPAC) is where Chad and Karen held their very first CrossFit Boot Camp during the summer of 2013, and many of our veteran Aevitas Athletes are a product of that very program at Tawasentha Park. Throughout the planning of our upcoming Open House celebration, we knew that we wanted to donate event proceeds to Tawasentha Park in one way or another. We are very honored to be able to give back to such a community establishment, and now it’s even more important that we show our support of the Guilderland Parks & Rec. Department and the Tawasentha Park facilities. 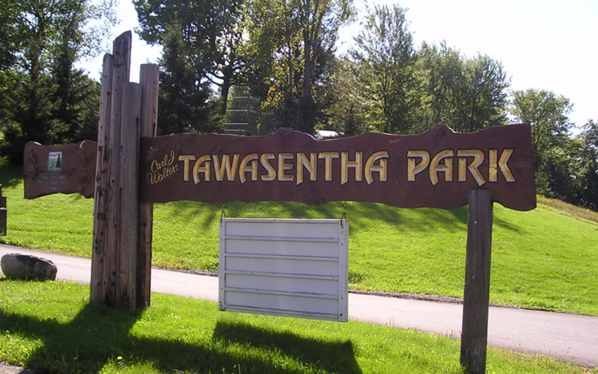 Let’s come together as a community and show our support for Tawasentha Park!